The pro­gram­mer of 25Q32 chips costs just 3.60 $. 10 joi­ners for F con­nec­tors for con­nec­ting an­ten­na cab­les costs just 1.99 $. This is a classical three-element antenna. It consists of one director which is directed to the telecenter (it has the smallest length), one driven element which is a folded dipole (double rod) which is in the shape of a rectangle and one reflector. The gain of such an antenna is about 5 - 6 db. Most likely, you will be able to catch a digital TV signal in the line of the sight at the distance about 15 - 30 km or reflected signal at 4 - 6 km from the telecenter. The construction of the yagi type antenna is known since the beginning of TV brodecasting. They are still widely used. Such an antenna is not suitable for the long-distance DVB-T2 signal reception as it does not give a big gain. In order to get a high coefficient of gain this construction should consist of more than ten elements. Every next director gives smaller and smaller increase of coefficient of gain than the previous one. Making a multie-element antenna is a laborious process which requires accuracy. 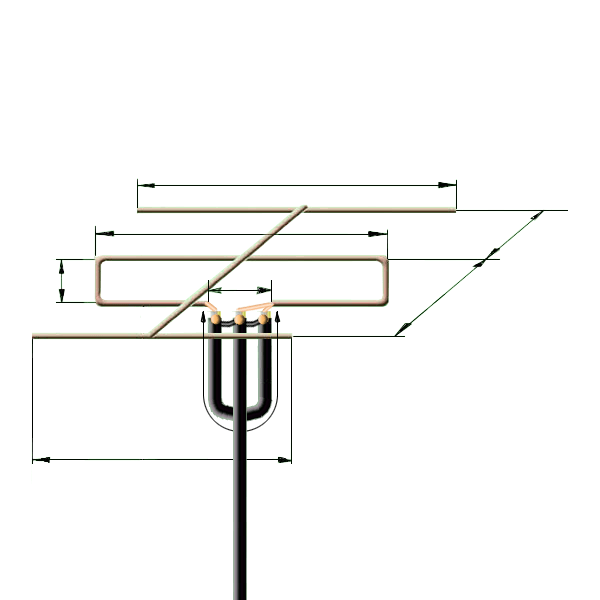 So the optimum variant for making yourself will be a yagi antenna consisting of three or four elements.